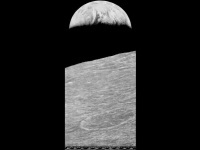 On August 23, 1966, the space probe Lunar Orbiter 1 sent the very first images of the earth rising above the moon‘s surface back to earth. Lunar Orbiter 1 was part of the Lunar Orbiter program started in the 1960’s in preparation to the Apollo moon landing. 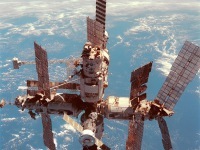 The project consisted of five unmanned spacecrafts, equally built to take pictures of the moon. The purpose was to find a safe landing place for Apollo rather than taking pictures of the Earth. When Lunar Orbiter 1 was already sent to space, scientists debated whether or whether not to point the craft’s camera at Earth due to the high risks that go along with it. The fact, that the United States were afraid of losing grip in the space race with the Soviet Union also made clear that no mistakes were acceptable. Still, NASA decided to take the chance and changed Lunar Orbiter 1’s position. 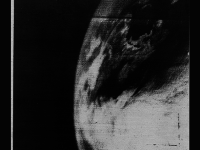 They were rewarded with remarkable pictures of the Earth-rise and Lunar Orbiter 5 was the first spacecraft to send pictures of the entire Earth in 1967, which were soon popular around the globe. Since the Apollo program was soon to start, the Lunar Orbiter spacecrafts had to be built quickly. Luckily, the American Department of Defense had Boeing and Eastman Kodak construct a spacecraft carrying an onboard camera. According to Jay Friedlander, a photographic technician, the camera took up a third of the entire spacecraft and was equipped with dual lenses. One taking wide-angle images and the other telephoto lens taking high-resolution images of many details at the moon. 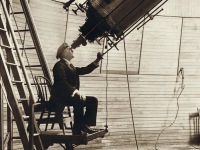 This way 99 percent of the moon’s surface could be covered with over 1654 images. NASA then printed out huge versions of some photographs to walk on top of them and find perfect landing places. All five missions of the Lunar Orbiter program were successful and depicted great contributions to the success of the moon landing in 1969. Sadly, none of the Lunar Orbiter spacecrafts survived after their missions. NASA purposely destroyed them for two major reasons. First, the radio signals from the different orbiters should not interfere with each other and second, the program used technology from the Department of Defense. According to Dave Williams, a planetary curation scientist, the United States could not risk a revelation of their methods, especially because the Soviet Union was deploying lunar orbiters as well. At yovisto academic search you might watch a short documentary about the mission Lunar Orbiter 1 and how the first images of the Earth reached NASA.